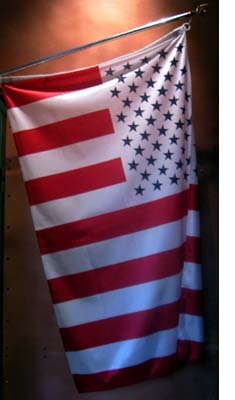 The united states Civil Flag. The banner of the Republic! In-law under the Constitution. FLY THE FLAG RESTORE THE DREAM! There is a flag that takes us back to our roots... back to the days of the Sons of Liberty, who swore they would rather fight than live as vassals on a feudal plantation. The Sons of Liberty inspired a Revolution that broke the chains of royal control over people yearning to be free. The flag they flew was red and white, with the stripes running vertically! Their flag became known as the "Rebellious Stripes" and was a symbol of their protest against British taxation and support of American economic freedom. Their original flag can still be seen at the Boston Museum. 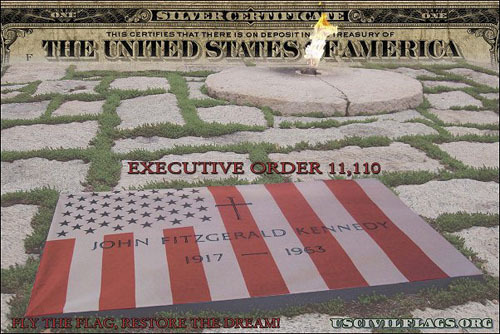 Their flag stood for LIFE, LIBERTY AND THE PURSUIT OF HAPPINESS! It is the flag that inspired the revolution that created the united states of America. But the flag they created was much MORE than just a banner for revolutionaries! Their flag created a dream in people all around the globe... a dream that said, "You too can take destiny into your own hands and become the master of your own fate!" Their flag is a flag of peaceful, strong, brave and generous people. It's a flag that says we KNOW the TRUTH of our origin as a nation. It's a flag that says each human has the right to stand on the strength of their own two feet and be supported by the common knowledge of the land... THE COMMON LAW! It's MORE than a flag! It's a symbol of the dream of the Sons of Liberty... the Founders of the united states of America! It's our COMMON heritage. It ties us together is a way that cannot be broken! You don't even have to BE an American to share this dream! Cry FREEDOM is the dream!! FREEDOM from the cruelty of the King! Freedom from the injustice of the taxman! Freedom from an oppressive government! Freedom from despots! Freedom from "The Patriot Act!" We can't let the dream die! We must RESTORE THE DREAM! We must take back our history, our constitution, our destiny AND our FLAG... the flag of our rebellion against tyranny, the flag of our FREEDOM! Fly the u.s. civil flag and tell the world YOU know the united states of America was NEVER intended to go down the corporate road! You know the truth about our history! You know about the Articles of Confederation, the Constitution, the Bill of Rights!! And you KNOW how they were stolen from the people! based currency coined by the Treasury of these united states. b. Byrevoking subparagraphs (b) and (c) of paragraph 2 thereof. "If we American people ever allow monopoly banking to control the issue of currency, first by inflation and then by deflation, these banks and bureaucracies that will grow up around them will deprive we, the people of all our property until our children will wake up homeless on the continent which God gave us for stewardship." "The bold efforts that the present bank has made to control the government, the distress it has wantonly caused, are but premonitions of the fate which awaits the American people should they be deluded into a perpetuation of this institution. If the people only understood the rank injustice of the money and banking system there would be a revolution before morning. You are a den of vipers and thieves." "But her mission will not then be finished; for ere another century shall have gone by, the oppressors of the whole earth, hating and envying her exaltation, shall join themselves together to raise up their hands against her. But if she still be found worthy of her high calling they shall surely be discomfitted, and then will be ended her third and last great struggle for existence. Thence-forth shall the Republic go on, increasing in power and goodness, until her borders shall end only in the remotest corners of the earth, and the whole earth shall beneath her shadowing wing become a Universal Republic. Let her in her prosperity, however remember the Lord her God, her trust be always in Him, and she shall never be confounded."